Welcome to the Trollope Prize Website! 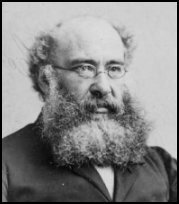 The Department of English, in collaboration with the Hall Center for the Humanities, at The University of Kansas is pleased to sponsor The Trollope Prize, an essay contest open to undergraduate and graduate students writing about the works of Victorian novelist Anthony Trollope. Please have a look around our new website, which includes submission dates and criteria as well as directions for entering the contest. Deadline for this year’s contest is June 1, 2019. Essays are invited on the topic of "Trollope and His World." Submissions may include essays focusing exclusively on the works of Anthony Trollope; comparative essays on Trollope and other writers; essays examining Trollope's work and career in the larger context of Victorian history, culture and society; historical or literary essays on topics central to Trollope's work and illuminated by his work; or essays on the reception of Trollope's work or on his larger cultural influence.